Kaiser Wilhelm der Grosse - life in the steerage Norddeutscher Lloyd steamship built 1897 at Stettin by AG Vulcan. This image shows steerage passengers gathered on the deck of the ship, some appears to be stricken by sea-sickness lying straight out on the deck, while others are relaxing. Description : Norddeutscher Lloyd steamship built 1897 at Stettin by AG Vulcan. 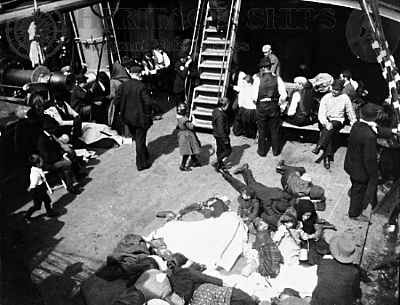 This image shows steerage passengers gathered on the deck of the ship, some appears to be stricken by sea-sickness lying straight out on the deck, while others are relaxing.